Fraser Davren from Glasgow is second left on the above picture of the winning Eastern Florida State College team. 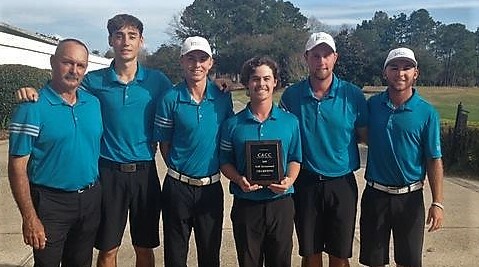 The Eastern Florida State College men's golf team won the Coastal Alabama Spring Invitational Sunday afternoon after a play-off. The Titans finished the final round tied with Mississippi Gulf Coast at 591, sending the two teams to a one-hole playoff. All five players from each team went back out and the Titans were 1-under on the hole while Mississippi Gulf Coast was even, giving the Titans its first tournament title of the spring. Sophomore Fraser Davren from Glasgow shot an even-par 72 to finish the tournament 1-under and claim medallist honours. Teammate Beck Fox shot a 76 in the final round and finished tied for 6th while Gregory Darnellshot a 74 Sunday and finished tied for 13th. Kyle Decenzo finished tied for 19th in the tournament. "Nice win for Fraser and good tenacity by the team to hang in there as the course played difficult today," Eastern Florida State College men's golf coach Jamie Howell said. The Titans, who shot 298 as a team in the final round, will play in the Florida Tech Panther Invitational March 4-6 at Duran Golf Club.